Maui Artist, Painter and Sculptor, Dale Zarrella will be presenting a Night of Art & Culture: A Portrait of an Artist. 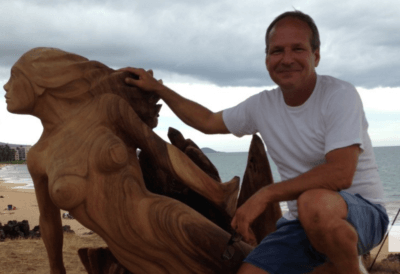 He will be sharing the inspiration behind his sculptures which will include myths and legends of the Hawaiian Islands. Learn about his visit to the Vatican in Rome to deliver “The Resurrection” to the Pope himself. “A Portrait of an Artist” is his book that is a backstage pass into his artistic genius. He shows several sculptures and art pieces in progress from a natural raw state that emerge into a hero, a goddess, an animal of the sea or another being altogether. legends followed by a Q&A with Jay April, CEO of Akakū Maui Community Media.